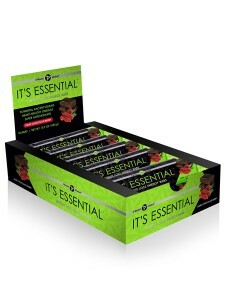 Our new It’s Essential Bars are fantastic choice for fiber and protein bar! These delicious bars are filled with protein and fiber and they keep you feeling filled up! The new It’s Essential weight loss energy bar pairs delicious flavor with powerful ancient grains to supercharge your weight loss results! Its dark chocolate raspberry taste is truly a flavor to crave, and the addition of a new, cutting-edge ingredient, SolaGrain, packs It’s Essential with dietary fiber to promote digestive health. Do not wait to pick up one of these tasty fiber and protein bars to help you feel full, energetic and to help you with all of your weight loss goals! If you’re looking for something on the go especially if you’re busy with work and building your business, these are a great fit for you! I’ve heard of customers keeping a box in their work drawers just in case they don’t have time to get up and grab something to eat. Each box includes 10 weight loss energy bars.